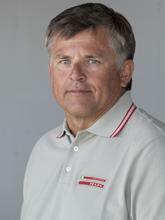 Steve Erickson (USA) is Sailing Team Coordinator for Luna Rossa, the Italian team making its debut at the America’s Cup World Series in Naples this week. Erickson has a long time relationship with the Italians, having sailed with former Luna Rossa skipper Francesco De Angelis back in the 80s and 90s. As we chatted Erickson noted that he was looking across to a castle where he and De Angelis celebrated after winning the One Ton Cup together in 1989. During the 1998 stopover of the Whitbread Race in Auckland while Luna Rossa was training there, De Angelis asked Erickson if he would coach them when the Whitbread ended. He’s done every Luna Rossa campaign since -2000, 2003, 2007, and now AC34. His role has shifted some - in his first campaign with the team he was sailing team coach while Rod Davis did the afterguard. In the second campaign he sailed as a member of the afterguard and for the third campaign he was Operations Manager, essentially the same job he holds today. Let’s talk about Luna Rossa’s performance over the past few days here? SE: The first day for us was survival - it was real rough and real windy and we really didn't want to capsize like Artemis and be up all night fixing stuff for not really a lot of points for the overall event. If you look into how the event works, you really have to be on your game come Saturday/Sunday. It was the roughest day we’ve been in the 45s and not that we took it easy but the guys did a nice job of just getting the boats around the course with the wing still in the air. You did a lot better today? SE: We did - today was a really nice day of sailing. When we came to Naples and the time we spent an hour north of here, that was the kind of conditions that we’ve been sailing in - just a nice 10-knots in relatively flat water - kind of what you expected when you come here. It’s spring time so it can be anything and there’s more coming so there’ll be some excitement this weekend. How’s your crew development coming along? SE: It’s the second day of our first event - the wing is new for everyone, the boat is a little bigger than the Extreme 40s, the experience is pretty balanced between the two boats with crew coming from the 40s, and half the team coming from the version 5 or some other form of monohull sailing so they’re getting up to speed with catamaran sailing. I think it’s going just fine considering just a few months ago a few of those guys hadn’t never been cat sailing. At the end of the day you get the good start, you play the shifts and you go fast and it’s a yacht race. Are the boys getting used to the physical demands of the 45? SE: I think the real work is getting the A sails up and down physically. That’s a big job for two people and it happens quickly. Yesterday on a few of the runs the boats didn’t even bother putting the kites up - farther into the race the positions were so defined as they were - the boats are pretty powered up just with the wing so you’re not going to double speed just because you have the A sail up. We just wanted to get through the day with the result that they were getting and be happy with that. How’s the course in Naples? SE: It’s my first event and the races almost seem a little long - 35 minute races. It was almost surprising as to how long the beats are but that said, it’s cool that they put the gate right down at the leeward wall - I would bet it’s within 75 yards of the wall - it’d be crazy to be down there at that railing looking down at the boats coming crashing into the gates - it’s pretty neat. How did the training with Emirates Team NZ go? SE: It went well - I pinch myself a little bit and use the analogy of the New York Yankees - to be let into an institution like Team NZ when I’ve been on the outside for 20 years - pretty interesting, there’s smart, hard-working people, people who’ve been at it a long time, and a lot of continuity. Grant (Dalton) has kept a real neat institution there. He’s a tough guy but I have a lot of respect for him. The guys who are good at what they do are very good. You find a lot of teams - including Luna Rossa - you spend quite a bit of time of the campaign getting to where you can just work together, speaking the language, using the same computer software, creating the same sailing techniques - that’s why Coutts and his merry men were such a force back in the 80s in match racing - they’ve sailed together for 25 years. People who put teams together and try to overcome a group like that…you’re always going to be coming up against those relationships that you can’t put together over night. How much sailing have you had on the 45s? SE: It was maybe three weeks, if that. A couple of those weeks involved physically receiving the boat - painting it, putting it together, then sailing it so it wasn’t quite three weeks of sailing before it went in the container to ship it here. Have you had many days in Naples before this Event? SE: Same thing happened with the second boat - we needed a yard where we could put the boat together and found a shipping yard an hour north of here where we received the boat and it takes a solid week to put them together. We managed to get another week of sailing in there and the nice thing is that we got the two boats sailing together which was easier to organize and monitor our training rather than going out and finding people to sail with. You’re a lot more efficient if you’re managing the two boats. Even with Team NZ, it was just not as efficient as if you’re on the radio talking to your people saying, ‘this is what we’re going to do’. Seems the locals are really getting into the Naples event? SE: It’s crazy! You look at the sea wall - it’s basically a 4-lane road which is what I’m kind of looking out at and if I glance up and down there’s about 300 hundred people just looking at the boats moored, just hanging out (7pm-ish local time). They’re into Prada they’re definitely into Luna Rossa, they’re definitely into sailing and there’s something about the America’s Cup. It’s been a part of Italy for quite sometime. And, the event is pretty cool - I’ll say that about it. It’s hard not to miss it. It’s literally physically taking up a big area of a very prominent nice waterfront - even if you wandered anywhere within a mile from here you’d be affected by parking and people and the chatter. Is it great being back in the Cup and doing what you’re doing? SE: Yeah, it’s what I’ve been doing since 1987 so it’s what I do - LOL - Steve Erickson needs to win the America’s Cup! Really, its long days and hard work, but good fun. Has much changed within the Team since you’ve been involved with them? The America’s Cup changes every day…but as far as the Team goes, the main change is that there’s Luna Rossa the brand, which has become a big brand in the America’s Cup. Within Italy Luna Rossa is a big brand and it’s beginning to represent what the All Blacks of the world, or the New York Yankees of the world do. The Team has always been pretty international - except perhaps for its first Cup campaign. All meetings get done in English and have for as long as I can remember… although my Italian is finally pretty good after 25 years! Why do you think Mr Bertelli wanted to do this again? Are you missing anything about previous AC events in mono hulls? SE: Not really. The only struggle I have with the 45s is to go out and have - call it 90 minutes of racing. Stepping back a bit, the old guard used to call what we used to do, ‘dock out’ - the AC version 5 boat would dock out at say, noon. Everybody would work toward that, get their foul weather gear on and walk down the dock, get on the ribs, get on the yachts and ‘dock out’. Now what we have termed it is - LOL - ‘roll out’ and that is the physical moment when you start pushing a wing or a platform down under the crane. I can tell you that from roll out to roll back in probably 8-9 hours go by for those 90 to 120 minutes of sailing. It’s not stressful but it’s all hands needed - all 11 people are needed constantly to put the wing up, monitor it, lift the boat into the water, monitor it there, attach it to the ribs, motor out to the buoy - that takes two hours and now we have two boats. You then have to do the reverse when you come in from sailing. That’s what I miss about the version 5 sailing - the hours of sailing versus the complexity of getting these boats ready. I can only imagine what it will be like with the 72s! How’s your 72 build coming along? SE: Hulls are getting close to being finished - perhaps another month. Then they’ll be shipped to New Zealand May/June to be assembled. It’s coming together - probably three months out. The idea is that we’ll sail it for the first time there. Our team’s energy has really been focused on getting through this regatta and Venice.